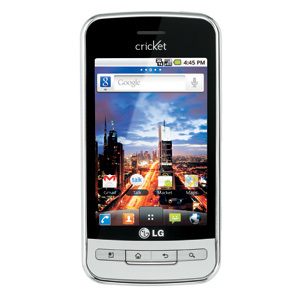 LG Optimus C Android smartphone is the version of LG Optimus One smartphone for Cricket Wireless. The LG Optimus C is the first smartphone from LG and third Android smartphone in the Cricket’s smartphone lineup. Similar to LG Optimus One, the Optimus C is also featured with lots of great smartphone features. 3.2-inch HVGA capacitive touchscreen display with 320 x 480 resolutions. Integrated with accelerometer sensor and proximity sensor. 3.2-megapixel camera with auto focus function. Runs on Android 2.2 Froyo operating systems. Integrated with A-GPS, Bluetooth enabled and Wi-Fi connectivity. Supports up to 32GB of microSD memory card. Has built-in 170MB of internal memory. Has built-in 3.5mm headset jack and Micro USB 2.0 port. Comes with a Li-Ion 1500 mAh battery that provides up to 336 hours of standby time and up to 420 minutes of talk time. Supported music formats including AAC, AAC+, WMA and MP3. The Optimus C Android smartphone with dimensions of 4.57 x 2.22 x 0.625 inches and weighs at 5.39oz is available for the price of $130 off-contact after a $50 mail-in rebate and a $20 web discount. However, this offer is only applicable to those customers who will sign up for Cricket’s $55 month unlimited plan.